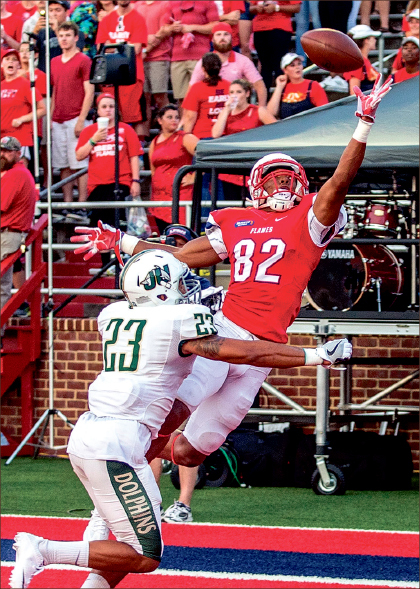 The Liberty Flames (1-1) spoiled the Jacksonville University Dolphins’ (0-1) season opener in blowout fashion with a 55-7 win at Williams Stadium that was dominated by the Flames from the start. 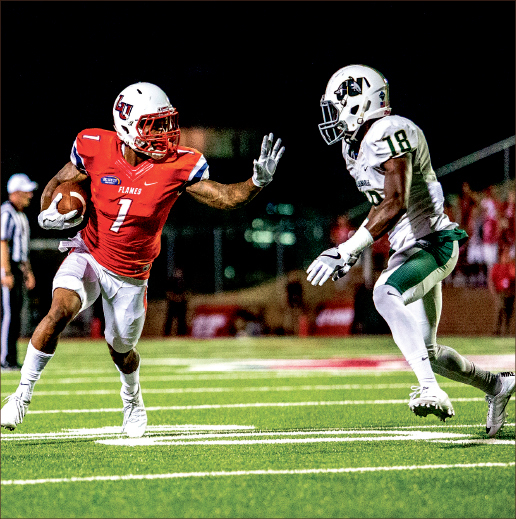 On the first drive of the game, the Flames capped off an 81-yard drive with a 2-yard touchdown pass to the corner of the end zone from junior quarterback Stephon Masha to sophomore wide receiver B.J. Farrow. Masha finished with 181 yards, three touchdowns, and one interception in just over two and a half quarters of play. The Dolphins took over the ensuing possession, and the Flames defense forced the Dolphins into a three-and-out, a defensive stand it would make on each of the Dolphins’ first three drives. The Flames held the Dolphins to just seven yards in the first quarter and had no difficulty containing their spread option offense that looked to fool the defense with fakes and misdirection. Their running game was led by strong performances from three backs: junior Todd Macon, redshirt freshman Frankie Hickson, and junior Carrington Mosley. Macon ran for 128 yards, followed by Hickson with 116 and Mosley with 87. Hickson tallied two touchdowns and Macon and Mosley scored one apiece. The Flames took a 31-0 lead into the half. After forcing the Dolphins to punt on the first possession of the second half, the Flames continued to expand their lead with an 86-yard touchdown drive that ended with a 35-yard touchdown pass from Masha to Shells. The Flames struggled on offense in their season opener against Virginia Tech, but Gill said he was pleased with the way the team responded one week later. On Jacksonville’s second possession of the second half, redshirt junior quarterback Rylan Wells started to put together a potential scoring drive with a 36-yard completion to redshirt sophomore Prince Gray. Two plays later, Wells was picked off by junior cornerback Tyrin Holloway as the Flames grabbed their fourth and final turnover of the game. With less than six minutes left in the third quarter, Liberty’s freshman quarterback Stephen Calvert entered the game. His first drive ended with a 37-yard field goal by freshman kicker Alex Probert. The Flames’ final score came on a 1-yard rush up the middle with 0:57 left in the fourth quarter. The team travels to Dallas, Texas to face Southern Methodist University, its second FBS opponent within three weeks, Sept. 17 at 7 p.m.
Clarke is the managing editor.